Luka won several photo club awards and many awards for his concert photography at home and abroad. But the most noteable awards are those for his documentary work. Shortlisted among 25 photographers out of 45,000 from all over the world for the job of lifestyle photographer in Melbourne. Slovenia - Through the Lens of Human Rights (SOFA Global): Best multimedia for The Girl Inside. Global World - Through the Lens of Human Rights (SOFA Global) photo competition: Finalist with his story "The Girl Inside"
Slovenia Press Photo best overall story for The Girl Inside, his work about Barbara, a girl with severe cerebral palsy, who is intelligent despite her illness and communicates using her eyes. Slovenia Press Photo: Best story in People category for The Girl Inside. 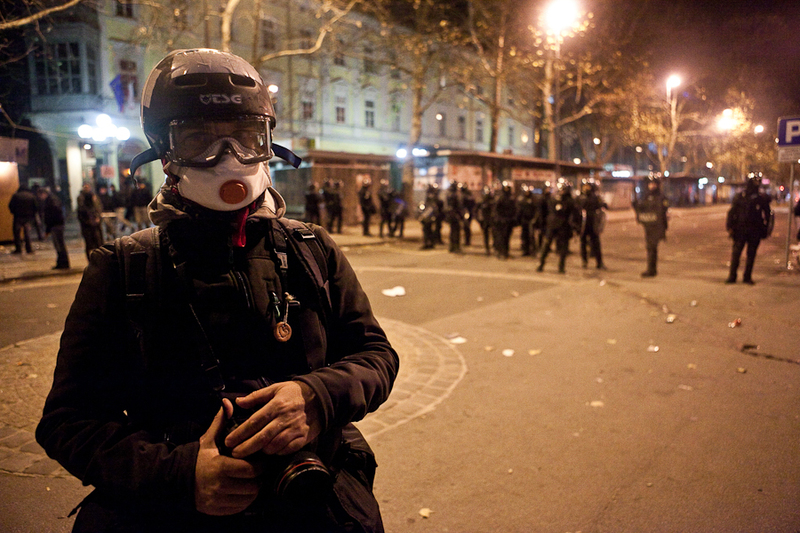 Slovenia Press Photo: Best story in News category for his three month coverage of anti-government protests in Slovenia. Slovenia Press Photo: Best story in Nature category for his documenting the safeguarding of the Venetian lagoon which is being affected by rising sea levels, climate change and sinking. Slovenia Press Photo overall best story for The Long Nights on the Marmara Sea, his work in Istanbul, following fishermen trying to make a living by fishing at night for rare schools of fish. Slovenia Press Photo: Best story in News category for his coverage of the 2010 violent student protests in Ljubljana. Slovenia Press Photo: Best single photo in Nature category for a photo from a 2010 extreme weather event, when 150 km/h Bora winds with blizzards pounded littoral regions of Slovenia. Nature Images Awards, France: 2nd place Conservation stories for The Sad Lake, his coverage of saving the fish from an intermittent Lake Cerknica as it is drying out. Nature Images Awards, France: 3rd place Conservation stories for his Saving the Marble Trout, a long-term project about an international project of preservation and rehabilitation of the endangered Marble Trout in Slovenia. Nature Images Awards, France: Terre Sauvage Grant for producing a new conservation story for Terre Sauvage magazine. Eventually, this was the story about Venice that won best story in Nature category of Slovenia Press Photo in 2013. Slovenia Press Photo 2009: Honorable mention in Entertainment category for a photo of Alice Cooper performing live in Munich.